Alpha shows the unbelievable first bond between man and canine after a young boy, Keda, is left for dead by his tribe when they witness him rendered unconscious by a bison attack. Now it is up to Keda to find his way home while braving the harsh wilderness with nothing but the companionship of a lone grey wolf that he befriends. Will it be enough to make it home in the midst of the unpredictable wilderness and harsh environment? Filmed on location in Vancouver, Canada and Iceland, the camera angles provide exceptional shots that alone will have audiences marveling in the beauty of the openness and rawness that the original natives had to endure some 20,000 years ago. The director definitely had a challenge in recreating that experience, but he captured what might have been in such a way that it seems believable. Alpha does contain certain special effects with regards to the weather and imagery that will have photographers marveling at the techniques that the filmmakers used throughout. That alone is definitely worth seeing. The element of language was also an interesting point as the entire film is depicted in an ancient language with English subtitles. It brings up the age old question of what the original language was and how language and communication have developed over time. It’s definitely an element to pay attention to because it does help the audience delve into the ancient element of the movie; however, it may be a turn off to those who are subtitle deficient, and no where in the movie is it determined exactly what language they are speaking. As far as the story goes, Alpha follows the coming of age story of one boy, Keda, as he is about to embark on his first hunt with his tribe leader/father. During the journey, he must decide if its better to lead with his heart or his head. The young actor who plays Keda did an exceptional job in portraying a teenager who faces the challenges of survival. Coming from other films, including his most recent role as Nightcrawler in the superhero films Deadpool 2 and X-Men: Apocalypse, Kodi Smit-McPhee stars as the boy who will become a man. He encounters Alpha, a lone wolf, separated from its pack as well, and injured. The boy instantly nurses the animal back to health and earns its trust as both wolf and boy help one another survive against the forces of nature. 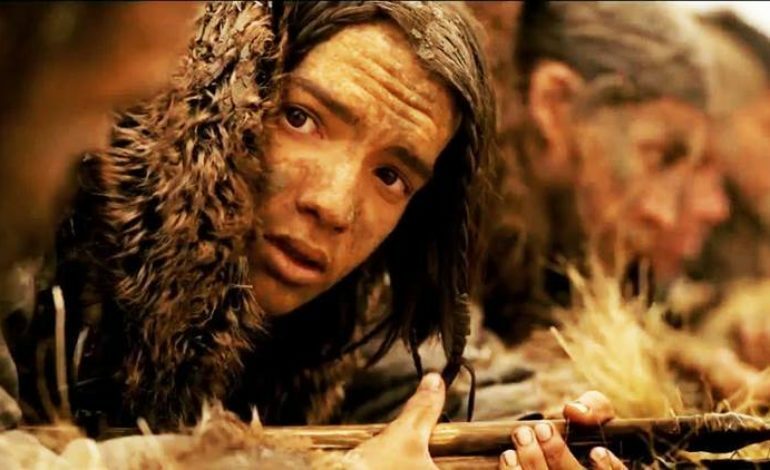 Prior to this film, I must say that I hadn’t paid much attention to McPhee, but the young actor does display certain characteristics that make him on actor with a lot of passion. Ultimately, it’ll be interesting to see how he grows in his career. At just about a 96-minute run-time, Alpha is a film for the ultimate photographer/special effects expert as the CGI and imagery will have anyone marveling over the beauty. The film can ultimately be seen as a truly original story line, though one might find themselves comparing scenes to that of Dancing With Wolves for the native aspects. That aside, it is definitely one to consider viewing. The only viewer discretion is if anyone has a problem with subtitles as the film is entirely in a primitive language. Alpha is a great movie with stunning visuals, an original story and exceptional special effects. Subtitles aside, it seems the director deceived the viewers with the trailer (in English) in a way that as soon as the people began talking, I found people taken aback by the language difference. I have no problems with it, but I do think the director should have included it in the trailer rather then sugarcoating it with English dialogue. Also the film has a way of surprising the viewer even down to the last scene in such a way that it will leave the audience saying, “What the heck?” in a good way.